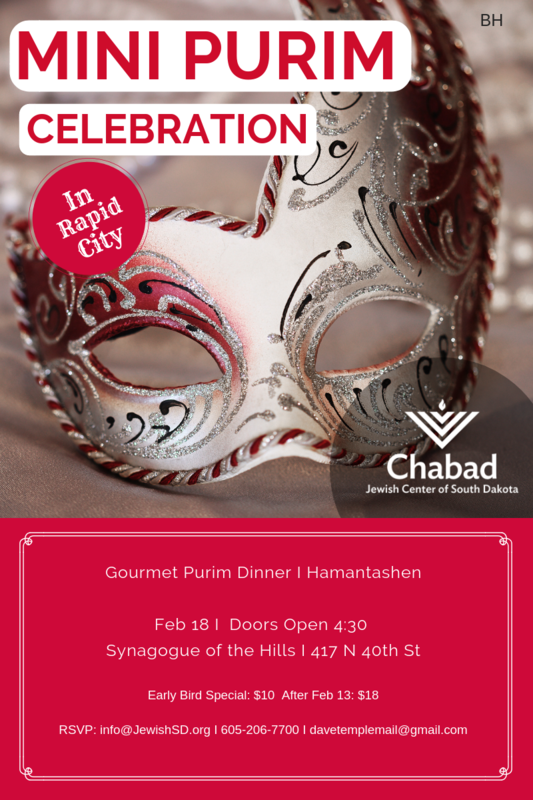 Join the Western South Dakota Jewish community for a Mini Purim Celebration taking place on a holiday that only happens once every 3 years. A lunar leap year, which is the year we find ourselves in now, takes place every 3 years, when the month of Adar is doubled, and therefore the holiday of Purim, occurs twice. Although traditionally, the mitzvot of Purim are not required on the Mini Purim (Purim Katan) holiday, we still mark this day with celebration, learning, and inspiration. Join us, Mussie's challah, matza ball chicken soup, and a feast fit for Purim, for an enjoyable and inspiring evening. We look forward to seeing you! RSVP is required. Kindly catch the early bird by filling out this form below or emailing davetemplemail@gmail.com.